Goal Setting & Planning for 2018—Go in to 2018 with your annual plan in place! Each week, you'll receive an email alert with access to instructional prerecorded video content & your assignments for the week—an action plan to lead generate, practice skills, and implement systems—for the week specified. 120-Day Access to Secret Facebook Group where you'll have access to me for additional support and guidance—Ask Your Coach Questions, Learn, Share Your Thoughts, Meet, Interact and Collaborate with Your Peers, Join Group Discussions, etc. #SizzlingContent!—Receive Links to #SizzlingContent found on the Internet. I'll post a link Daily (Weekdays, Monday - Friday) in the Secret Facebook Group to an article ready for you to share on your Facebook Page and Twitter. This will save you time and takes the guesswork out of what to post! Access to Tools and Resources Includes Participant Workbook/Guide and Support Documents: Forms, Checklists, Buyer Presentation, Pre-Listing Package & Listing Presentations Slides, Templates and, Dialogues & Scripts! You'll be ask... to make a commitment and effort to succeed, to complete all assignments, be on time for your coaching sessions, etc. Remember: You now own your own business and are responsible for its success. While this program is design to help you establish a firm foundation of skills and help put you on the fast track to success, only you can put in the work to make it happen. So, make the commitment and invest in yourself and your business growth! Sales & Marketing Pipeline Management... Unlocking the Power of Sales and Marketing in Today's Digital Age! ATTENTION NEWER AGENTS: With 87%* of All Real Estate Agents Failing In the 1st 5 Years, Why Leave It to Chance? Be One of the the 13% That Succeeds... Boost Your Chances of Success... Join 2018 Coaching Club Membership! CLUB Membership NOW for ONLY $299 for the entire year! Sign up for 2018 Coaching Club Membership for a reasonably low annual fee. This Members Only Club is jam-packed with terrific value! 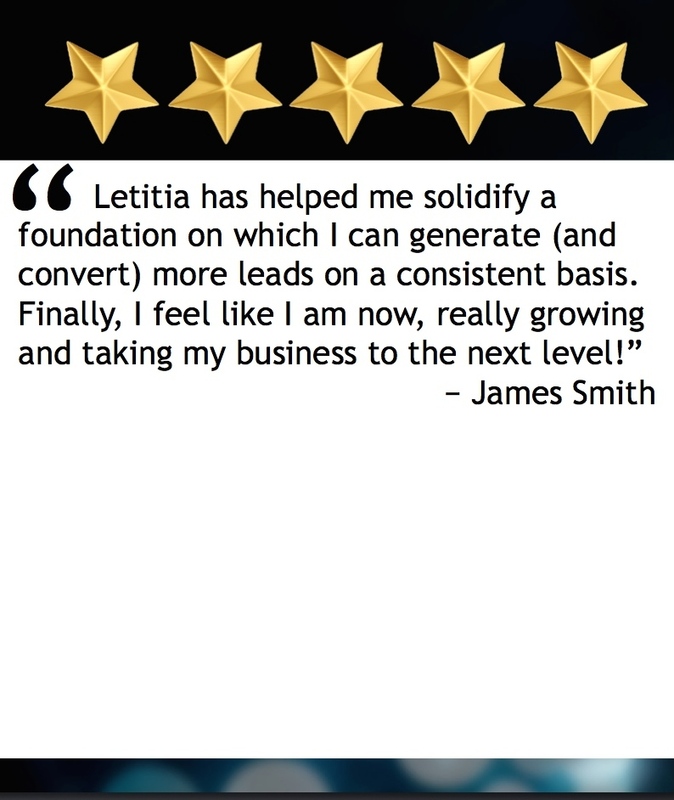 Want to take your business to the next level? Want to DOMINATE in 2018? Commit to Your Success! Whether you are a new agent just starting out, or a more experienced agent who's interested in taking your business to the next level, this club offers a roadmap to help you get you up and running fast while helping you develop habits for long-term success. Join this Members Only Club and Sign Up Today! Join this Members Only Club... Sign Up Now! Special Offer EXTENDED: For a Limited-Time, Join 2018 CLUB Membership NOW for Only $299 for the entire year! resources being offered and the coaching component, no refunds are available. 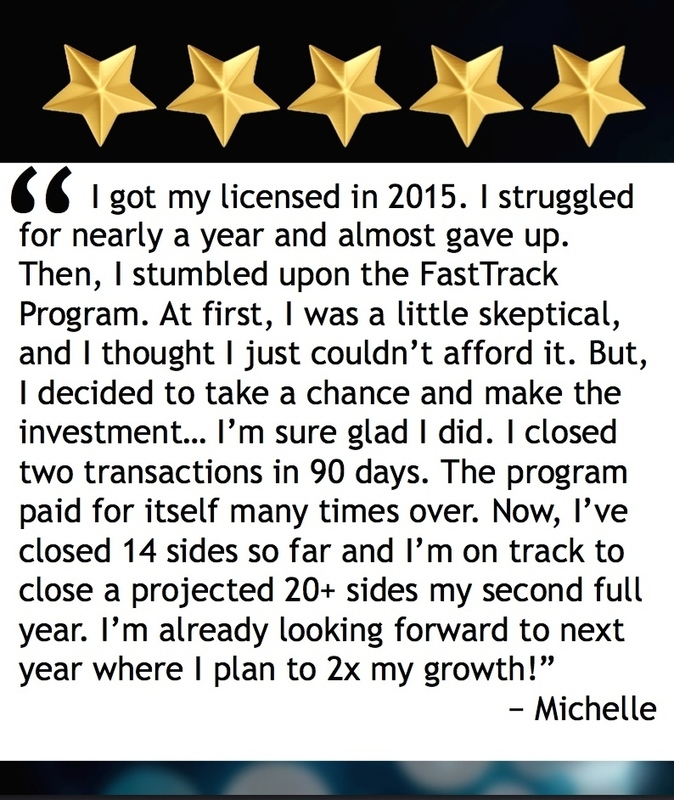 8-Week FastTrack to Success Program - FREE, Offered Up to 3 times a year (Value: $697) > This program offers a roadmap to get you up and running fast while helping you set the foundation for long-term success. Note: While participation in this program is not required, it is highly recommended. Access to Monthly Training Content/Video > focused on Sales and Marketing Pipeline Management topics from Brand Awareness/Lead Generation to Sale/Post Sale Marketing, as well as Digital Marketing, Social Media and Technology. 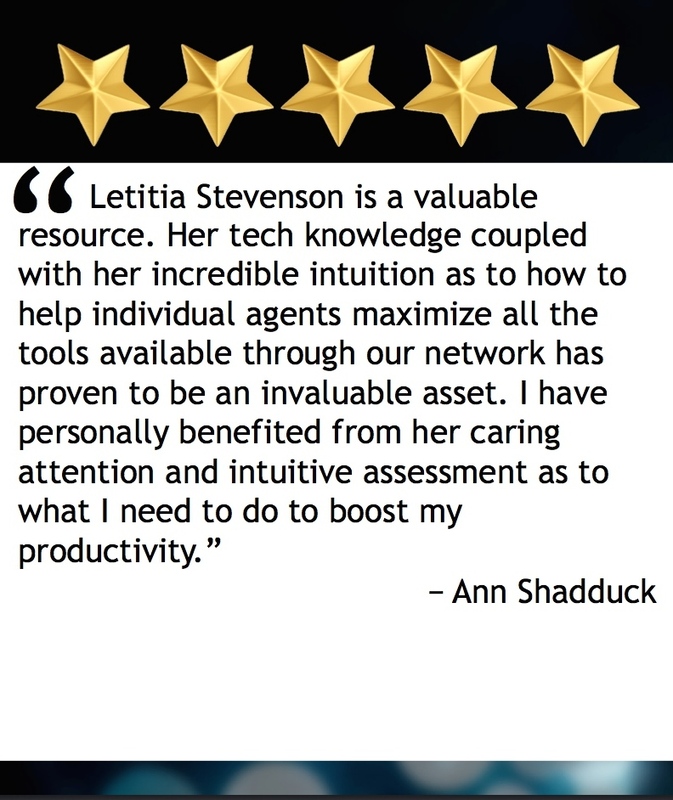 Tap into Letitia's knowledge acquired from 20+ years experience in Sales & Marketing and Technology, and 10+ years in real estate! 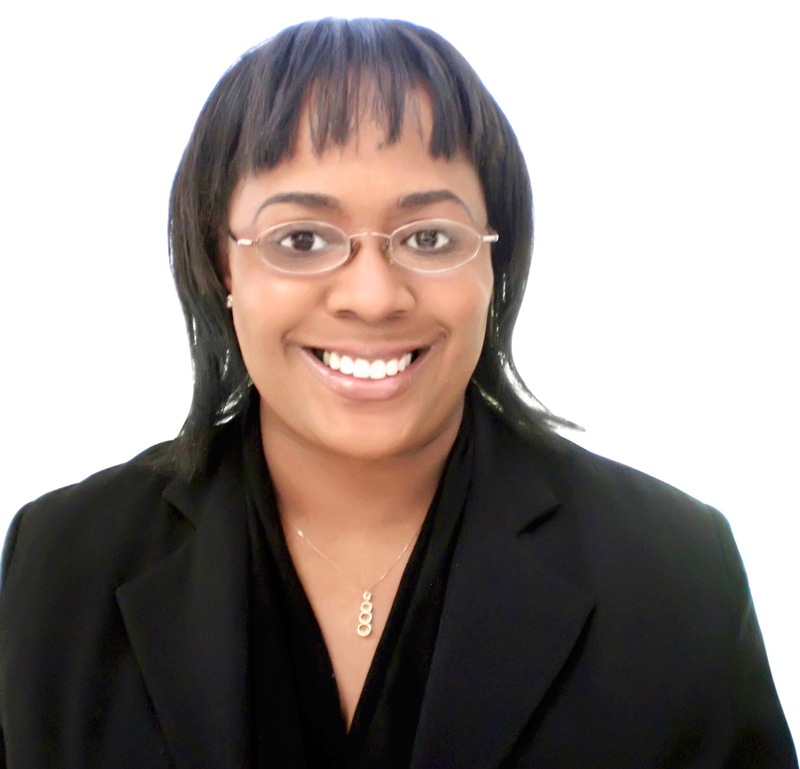 Weekly Success Tip (40 Weeks) > Receive weekly success tips to help you grow your real estate business. Access to Tools and Resources > Access to available forms, Checklists, Templates and, Dialogues & Scripts, etc. You'll be asked/encouraged to make a commitment and effort to succeed > Remember: You own your own business and are responsible for its success. Ideally, you want to reach beyond just getting that next transaction, and focus on sustainable business growth. While this program is design to help you establish a firm foundation of skills and help put you on the fast track to success, only you can put in the work to make it happen. Make the commitment and invest in yourself and your business growth! Each week, during the 8 week period, you'll receive an email alert with access to instructional content & your assignments for the week—an action plan to lead generate, practice skills, and implement systems—for the week specified. 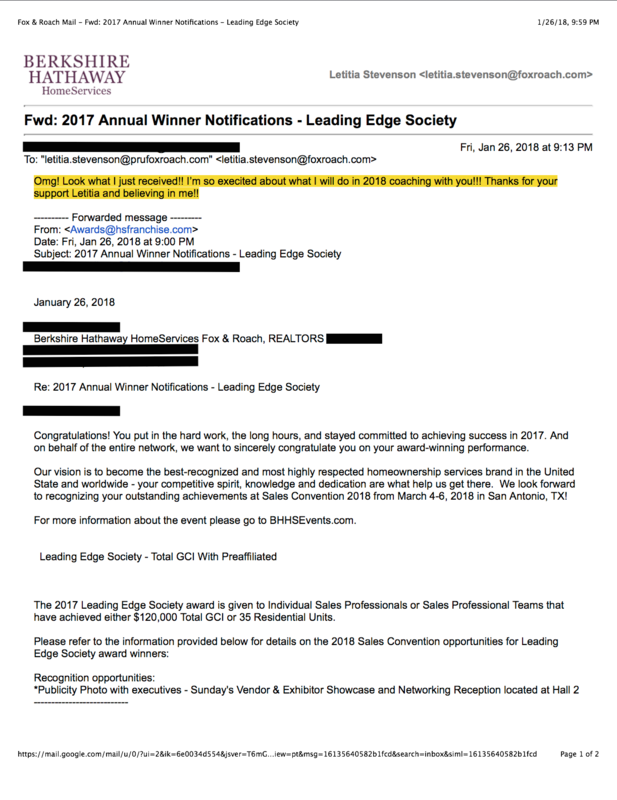 Goal Setting and Planning for 2018, including a 90-Day Success Action Plan. *This 8-Week program is based on the 12-Week (90-day) FastTrack Program; and, it has been modified to get you up and running fast!